Spread the butter onto one side of each slice of bread. Top an unbuttered side of one slice with a slice of cheese, the tomato, the avocado, a slice of cheese, and the remaining bread, buttered side up. Spread the butter onto one side of each slice of bread. Top an unbuttered side of one slice with a slice of cheese, a slice of ham, the egg salad, a slice of ham, a slice of cheese, and the remaining bread, buttered side up. Nothing says summer like dairy products from the number one dairy state, California. From scoops of cold, creamy ice cream to melted cheese atop juicy grilled burgers, dairy and summer menus go together like sweet corn and butter. But nothing spoils the summer fun like spoiled milk, which is why it's important to know how to store your dairy products - especially in the hotter months. 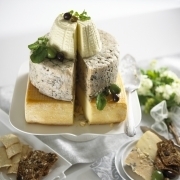 SOUTH SAN FRANCISCO, Calif. & MODESTO, Calif. – (May 13, 2013)—Move over cupcakes and cake-pops, this season’s tastiest wedding trend has officially arrived, wedding cheese cakes. Elegant wheels of California cheese stack up to create a savory spin on the classic wedding cake and offer couples a tasty way to personalize their special day.